The emergence of Save the Deaf and Endangered Languages Initiative [S-DELI] as one of the partners of Global Giving in the June 2018 Accelerator Fund Raise did not just come as an amazing development but also as one to be thankful for. It was on this basis that local supporters of Emma Asonye and Project S-DELI decided to throw a get-together party on July 24, 2018 to celebrate this success. 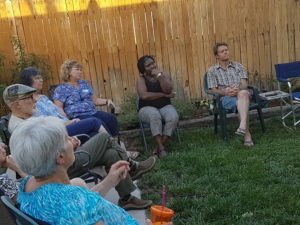 The party, which was hosted by Susie Olson, one of the major donors in the June Accelerator and a strong supporter of Project S-DELI, started at 5:30 pm with a host of other passionate supporters of S-DELI and Emma Asonye’s family in Albuquerque, who were largely volunteer members of a non-denominational Christian organization – International Students Institute (ISI). 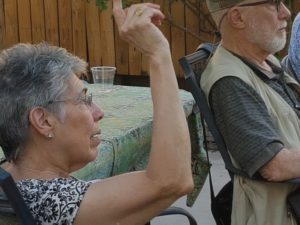 The party was rich in assorted types of Mexican food and snacks– the enchiladas, the tacos, guacamole, etc., plus ice cream and cake. 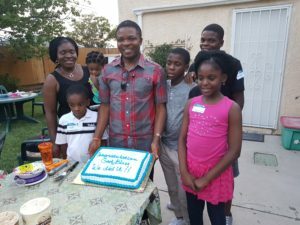 In the usual flow of activities, the party began with food and drinks, followed by one-on-one talks, after which the chief celebrant, was called to give his presentation. In his speech, Dr. Emma Asonye, on behalf his family and Team S-DELI thanked the host and organizers of the party, not just for the party, but for their consistent supports to Project S-DELI. 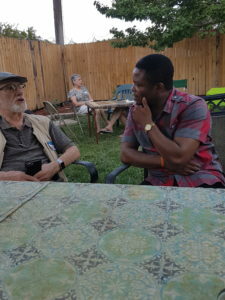 He also used the opportunity to share the broader vision of S-DELI, the documentation of indigenous Nigerian Sign Language and the benefits of being a Global Giving partner. He also informed them of the next fundraise opportunity, the Youth Week Fund Raise, (August 6th – 12th), in which Team S-DELI would participate. This was followed by a Q&A session, where the attendees asked question from all sides. In an interview, Susie, the host, and Joniva, one of the major donors in the last June Accelerator Fund Raise reiterated their supports and commitments to Project S-DELI and encouraged people to invest in the project, which according to them, gives hope to the vulnerable population in Nigeria. The rest of the attendees also expressed their interest to continue to support the S-DELI activities. For many of them, it was an opportunity to hear firsthand, the vision of S-DELI in full, with which they were satisfied. There was presentation of celebration cake to Emma Asonye’s family, more food, dessert time, and more of one-on-one chats, in the midst of which Dr. Peter Briggs of Daystar International Institute donated a V-Lux video camera to Project S-DELI for the documentation project. The party lasted till after 8 o’clock pm.